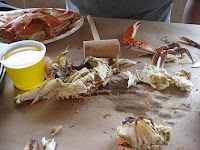 Fat and Happy Blog: Crabs in Annapolis! One look around Cantler's in Annapolis, MD, and you will realize every person in the joint has crabs! By way of boat, Cantler's is just around the corner from the Naval Academy; a little tougher to get to by car, but only if you don't know where you are going. 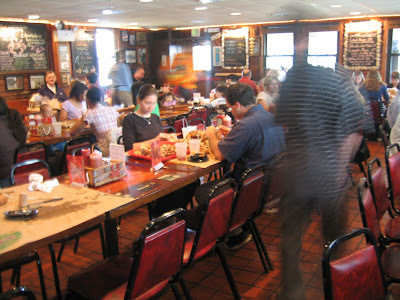 This place is exactly what you would expect, more of a hole in the wall than anything, but a comfortable place where everyone feels at home with long tables that everyone shares with trays of crabs running the length. Blackboards with hand written notes describing how to crack and eat a crab; and one that tells what crabs are available (small, medium or large). As Dave noted, this is the only restaurant we've been in where ALL the kids were extremely well behaved; I equate th is with the idea that they have something to occupy their time - mainly pounding on crabs with little mallets. Hell, I was pretty damn happy too! We ordered a round of hush puppies and a bowl of mussels as well. The mussels were outstanding in a white wine sauce. And the crabs were good too- but you learn why crab meat is so expensive to buy; it's a lot of work for a little amount of crab. Look on the wall to see what they are serving today and what the price is. We went with the Medium size crabs - which ran us about $55.00 for a tray of a dozen crabs. Not a bad deal. If someone in your party is a little squeamish, they do have a few other options like deep fried fish and clams. You can even walk down the steps to the river and look at your dinner before your meal. Theresa decided to get friendly with her crab prior to eating it! 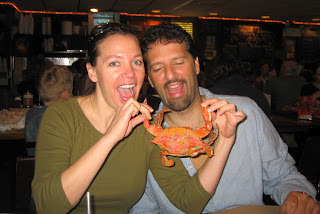 Not sure who is more afraid, her or the crab! Next time your in the Annapolis vicinity - stop by Cantler's. You'll have a blast .... you'll smell like crab for a couple of days, but it's worth it! Crack, smash, eat and be fat and happy!